This blithe young man looks to me to be around 15 to 16 years old. Do you think it is one of the first times he was let off the leash by his parents? The cheeky look on his face in both pictures, but particularly in the pose with the cigarette, suggests, YES! Were these taken to impress a girlfriend, show off to his mates or as an accidental souvenir of his right of passage to adulthood? Whatever the case they were someone’s memento for many decades. 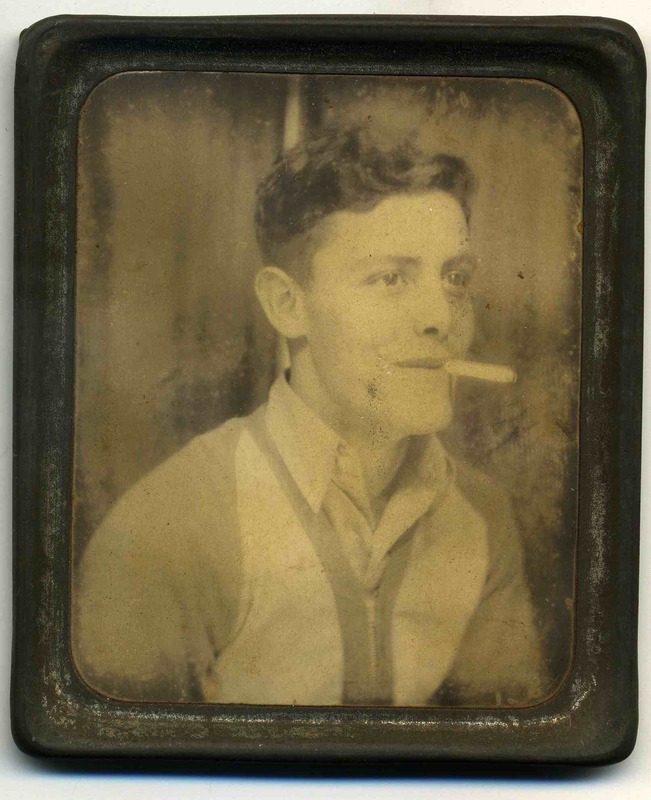 Despite being faded, tarnished and stained, the photos radiate youthful joie de vivre some 74 years after they were taken. I can still feel his glee. 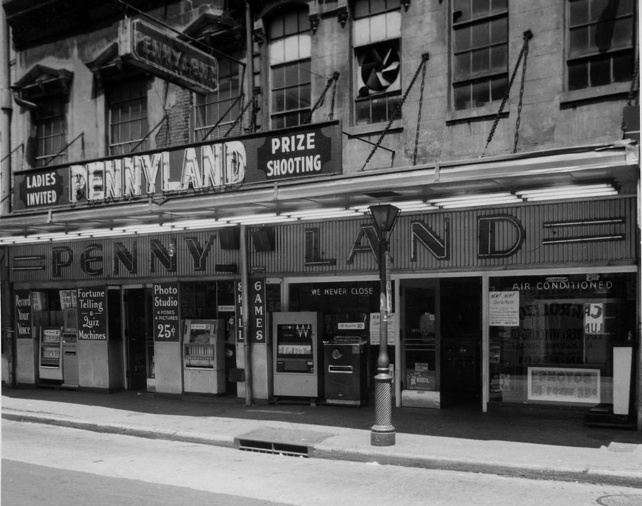 From what I have been able to discover, there were many Pennyland centres around the US and Canada offering a large selection of games and coin operated machines to amuse all ages. I think some were stand alone places but more generally they were part of a larger amusement park. The Pennyland where the above photos were taken has long since disappeared, as I can find no reference to it online. Any helpful information from out there would be most welcome! Entrance to the Pennyland Arcade at the Glen Echo (Maryland) Amusement Park, 1928. View of the Pennyland Arcade at 131 Royal Street, New Orleans. Date unknown. It’s funny, but I didn’t even recognize that these are the same guy until you pointed it out. Interesting. But for the fact he is wearing the same clothes, and the similar gap in the curtain behind him, I would’ve thought they were taken on two different days – maybe they were? He was probably on holiday and had few items of clothing with him. I prefer to think the first one was at the beginning of his day out and the second, where his hair is all messy, was towards the end. He had had fun. Maybe his hair was tousled by a cute girl! Or he had a hair cut! For whatever reason my first thought was to wonder if he survived the war. If he was 15 in 1938 than he was at least 18 in Dec of 1941, when Pearl Harbor happened. Cheeky chap that he was. Very melancholy observation, Mike. 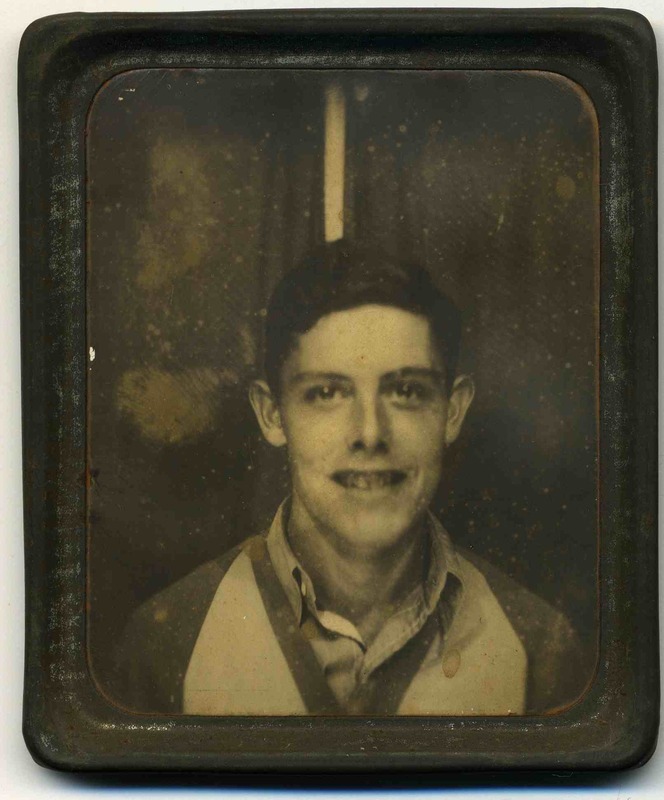 I often think about that when I look at the civilian photobooth photos I have from pre-war Germany. I have never before thought about my American civilian photos in that way. I love old photos from the American Civil War. They always make me think about who survived and who didn’t. We humans are really good at ruining other people’s lives. The Americans, British, Australian, and other brave souls who marched into hell to save our way of life in WW ll are heroes, one and all. So I cannot look at a photo of any young man from that time without considering his likely service and sacrifice. Yes, it is melancholy. That is part of who I am. Lovely, Mike! I will look at my photos of this era in a different light. Thanks for visiting my “punny” photoblog and leaving a few “likes.” Yours is a really clever idea for a blog! I don’t imagine that anyone else would have the years of photobooth archives to duplicate what you are doing. Thanks John. I don’t think I chose the idea for the blog. It chose me! Looked up some information on Pennyland in Canada. Apparently, there is a Urban legend ghost story related to an abandoned Pennyland amusement park in Manitoba/Saskatchewan. Those arcade parlours remind me of the ones they had at the Toronto CNE when I as a child. I think I read that story when I was researching the post. There were so many Pennylands in North America. Hello! 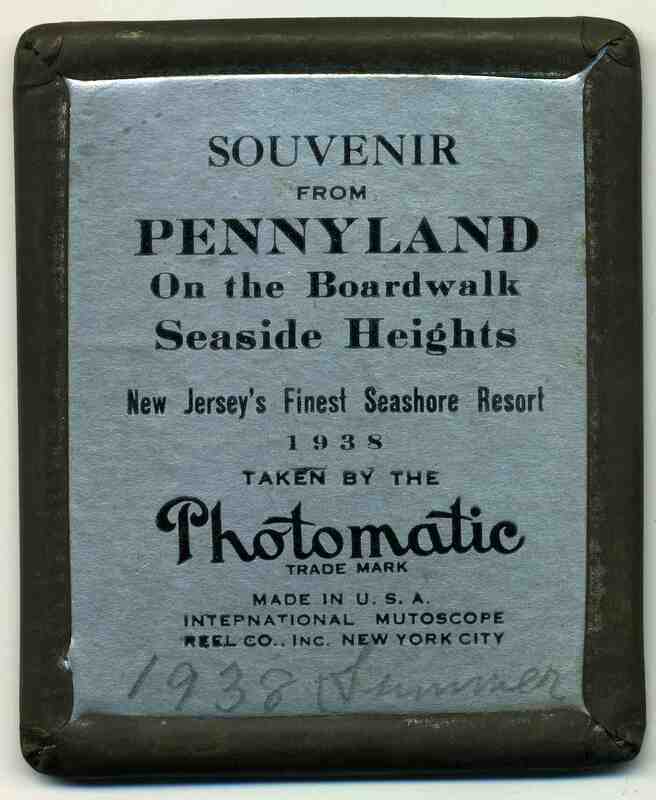 I came across this after finding my dads Pennyland momento from the same place (Seaside!) my dad is about the same age in the photo however his does not have the date printed on it. I wanted to share a pic of the front and back here, but I can’t attach anything. This is the only internet reference I can find to the seaside pennyland.